2018 has – rightly – seen a strong emphasis on the story of the suffragettes, of those courageous individuals who took to militant methods to get the vote for women. This is not their story; it is the often-overlooked story of the many thousands of women and men who fought throughout the 19th century to get equality of franchise for men and women. It is the story of the many who through their struggles and sacrifices have affected society today. The Women’s Suffrage website has been created for secondary schools to help teachers and pupils explore the rich history of the suffrage movement and explore how peaceful protest turned to militant tactics. The web resource is centred on a database of approximately 3,000 individuals from around the UK. For many, little is known other than their name and place of residence: others allow us to dig into the past and bring their stories alive. Schools are encouraged to use the database to explore suffrage activity in their localities. 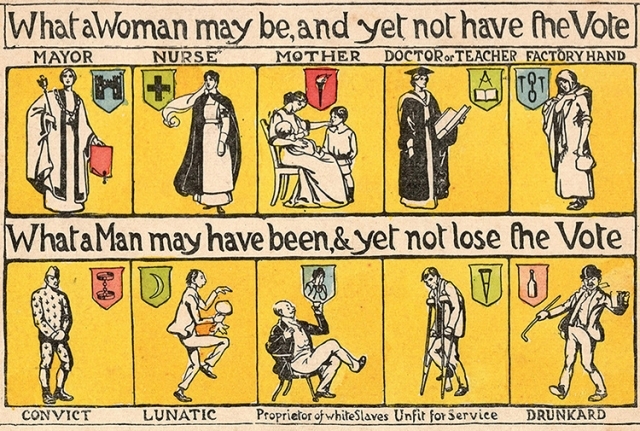 Pupils can find out about the Priestman sisters who were active campaigners in Bristol who used peaceful but disruptive methods into their 80s, or Rosa May Billinghurst of Lewisham South London, who would use her wheelchair to carry campaign literature around. The women’s suffrage campaign was a mass movement that involved women (and a few men) from up and down the UK and around the world from many different backgrounds. These women believed that having the vote was needed, possible and rightful. How they should achieve that right was often the dividing factor, with those who carried out the more aggressive tactics becoming the better-known or more notorious names. Historical resources for schools tend to over-emphasise the role played by high-profile leaders of the women’s suffrage movement and the eye-catching militant methods of the suffragettes. As a consequence, it can be difficult to fully cover the significance of suffrage activity before 1903 including the many different peaceful methods used by constitutional suffragists at a local level. Working with the Cabinet Office, the Historical Association has developed an online resource using data from the 1866 petition and the 1914 Home Office Amnesty records. The 1914 records have been transcribed for the first time here to allow easy access for pupils. The website has been particularly designed for Key Stage 3 and GCSE history and citizenship teachers and pupils, and there are also materials for A-level. The resources include case studies of important campaigners, academic podcasts, and knowledge-rich lesson resources for exploring the issues of the time to ensure that pupils develop in-depth knowledge about the campaigns and campaigners that helped to mould Britain’s evolving democratic history. "This is a fantastic resource which I hope will educate school children about the efforts, the stands and the sacrifices so many people made for us to have equal representation in this country." The resource launches today (21 November 2018) to tie in with the 100-year anniversary of the Qualification of Women Act that allowed women to stand as Members of Parliament. The project has been funded with the help of HM Government.